3M465XL Permanent, acrylic transfer tape coated with a 400 adhesive, high performance acrylic-based adhesive with an extended paper liner 2 25 oz. 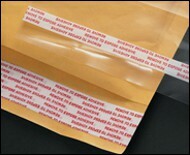 Permanent Permanent bonding of light weight paper, plastic, glass and fabrics; ideal for envelope flap closure, shelf talkers, inventory tags and snap out sets, labels, coupons, danglers, self mailers for return information and packing slips. 1074 Removable unsupported rubber-based transfer adhesive with an extended 42# blue printed Kraft paper liner 1 11 oz. 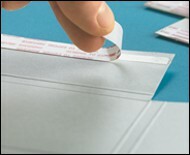 Removable Designed for temporary and reusable applications such as mailers and envelopes, business and hospital forms, labels, advertisements and light weight attachments that require a temporary bond. 1075 Permanent unsupported rubber-based transfer adhesive with an extended 42# red printed Kraft paper liner 1 104 oz. 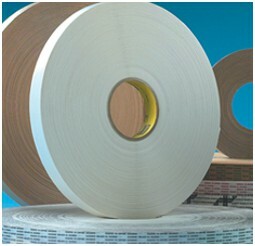 Permanent Permanent bonding of light weight paper, plastic, glass and fabrics; ideal for envelope flap closure, shelf talkers, inventory tags and snap out sets, labels, coupons, danglers, self mailers for return information and packing slips.